Israeli soldiers abducted, on Sunday at dawn, three young Palestinian men, including a former political prisoner, in Qalqilia governorate, in northern West Bank, and summoned for interrogation three others, including two children, from Bethlehem governorate. 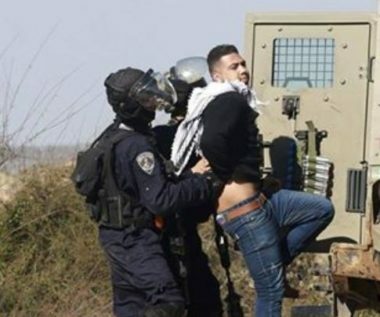 The Qalqilia office of the Palestinian Prisoners’ Society (PPS) said the soldiers abducted a former political prisoner, identified as Riyad Da’das, after stopping him at a military roadblock near the city. It added that the soldiers also invaded and searched homes in the al-Jisr area, near Kafr Laqif village, east of Qalqilia, and abducted two young men, identified Nimir Mahmoud Halawa, and Mohammad Zaki Majd. In related news, the soldiers invaded and searched homes in Teqoua’ village, southeast of Bethlehem, and summoned Bara’ Ziad al-‘Amour, 22, Zayed Mohammad al-‘Amour, 15, and Ahmad Suleiman Abu Mfarreh, 15, for interrogation in Etzion military base and security center, south of Bethlehem.